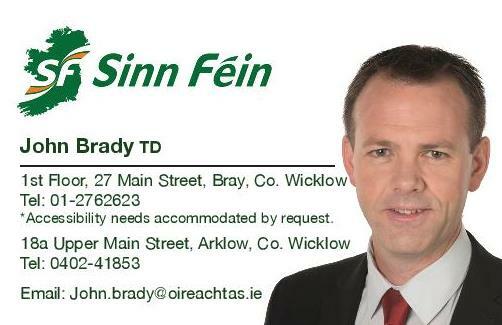 Sinn Féin TD for Wicklow/East Carlow John Brady has urged caution at Minister Coveney’s controversial new model for funding social housing building through public private partnerships. “At Monday’s meeting of Wicklow County Council a decision was reached to enter a Section 85 of the Local Government Act where an agreement is now in place between Wicklow County Council and Dublin City Council to develop 50 social housing units on Convent Lands in Wicklow Town using Public Private Partnership. “The Project Company will design, build, finance and maintain the houses for 25 years. “Sinn Féin wants to see the delivery of much needed social housing in Wicklow. However, there are some serious questions the Department and the Minister needs to answer around the use of this particular funding model. “Wicklow has been included in the first tranche of counties to use this funding model to deliver social housing units along with parts of Dublin, Kildare and Louth. “Sinn Féin have contacted the Department of Housing and outlined a number of serious concerns we have with these PPP proposals. “Some key concerns include these projects ability to deliver value for money for the taxpayer. There is a growing consensus that PPPs do not deliver the value for money to justify the additional financial costs charged by the private bidder. There is also the potential to expose the taxpayer to additional financial costs particularly when there are disputes or failures to comply with the original agreement. “The use of PPPs over complicates and delays the delivery of much needed social housing. Using this model of housing social delivery and assuming that there are no delays, disputes, or contractual defaults, it will take up to three years to deliver 500 units across the local authorities involved. “The Minister should scrap the current proposals and fund the first tranche of 500 units either via 100% central government capital financing or with low interest Housing Finance Agency loans.